Beginning in June 2009, although the artwork looked a bit dated and the second volume was a reissue from the "Horror Classics" series, Echo Bridge Home Entertainment provided some much needed budget horror packs with a $5 price which appealed to casual shoppers and horror movie collectors alike. But, in September 2009, they started getting tricky with it. Note the way that "Salvage" has been replaced by "Wages of Sin" and its position on the coverart moved around to make another pack. March 2010 was a busy month for Echo Bridge Home Entertainment as they released four new horror collector's sets. Note that "Skeleton Man" has been repeated from the first volume and has been joined by "Wages of Sin" from the previous one. The "Surf 'n' Turf" sea monsters and werewolves set is comprised of two existing double-features. "Night of the Living Dead" from the second volume shows up again while "Nadja" makes an appearance in the spin-off "Vampire Collector's Set" (which Amazon backdates to September 2009). Curiously, in a pack which Amazon dates to February 2010 but calls "Vol. 6" (it can't be both! ), the remaining titles from volume one, "Prom Night" and "The Nurse", are now joined by "Descendant" and "The Dead One" in a restyled pack. "Mortuary" and "Memory" from the third volume are then added to create the first 6 pack. 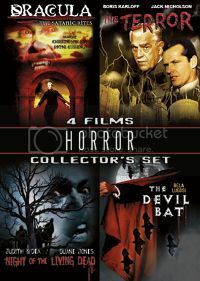 The range of "Horror Collector's Sets" ended in June 2010 with a final burst of trickiness. Why Echo Bridge Home Entertainment thought that anyone would choose to buy "Skeleton Man" again instead of "Lost Souls" is mind-boggling. Of course, we haven't heard the last of these titles anyway as Echo Bridge Home Entertainment reissued them again in the "Midnight Horror Collection". These older multipacks are still available from most retailers including Amazon. 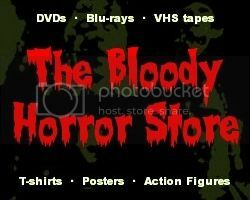 If you would like to support this blog, you can buy them from "The Bloody Horror Store" (which is also Amazon) instead.